by James M. Cameron, CM., ED. The beginning of this summary of the antecedents and lives of two American ex-soldiers and a Loyalist family who were pioneer settlers in Antigonish (in their day Sydney) County was sixty years ago. I spent two of my boyhood summers at a farm in Saltsprings, a farming district part hills and part intervale of the West River, as tranquil and beautiful a piece of pastoral scenery as Nova Scotia may boast. I was the guest of a paternal aunt and her husband, Mr. and Mrs. Frank Kinney, a couple who toiled from sunup to sunset on a subsistence farm, in the pattern of rural life as it was then. It was a hospitable home to where visitors came abundantly. Rare was the summer weekend when the spare bedroom was not occupied and the dinner table not crowded. A boy of ten is impressionable. To this day I remember in detail the talk of my Aunt Irene and my grandmother, Harriet Jane Pushie Cameron (1850-1944), of relatives Hulbert, Williams, Pushie  my grandmother was all three of these  not to mention the connection of Cameron, Chisholm, MacMillan, MacGillivray, Dochenassie, Poison, Clark, Cunningham, Goodwill...the list is a long one, spread far, far, afield. Gifted with a phenomenal memory she retained until a few months before her death at ninety-four, my grandmother "carried in her head" as her neighbours said, the family genealogy, and that of most of her neighbours, from the beginning of settlement in Antigonish. Knowledge of earlier generations in the United States and Scotland she did not have, nor to the best of my knowledge, was anyone reliably informed on this phase. As much for my own pleasure as to correct this deficiency, I have pieced together from what sources I could accumulate an outline of the careers of Pushee, Williams, Hulbert, and their forebears. That my story is woefully incomplete and all too brief, I am the first to admit. It is, I trust, consistent with the information made known to me. No words of mine need try to praise the names of Pushee, Williams, Hulbert. The pioneers lived out their lives on land they had turned from forest into farm. Their descendants progressed economically with the country. The great majority of them are now to be found in places distant from Antigonish; no small number took up residence and citizenship in the United States. Newfoundland to British Columbia, they are to be found in every Canadian Province. As I have done with respect to my immediate family, whosoever will, may, with my blessing, undertake the task of assembling their own family tree. Should the reader have half the enjoyment in reading as I had in writing, I shall feel amply rewarded for my effort. An allusion to the folk in Nova Scotia s Antigonish County generally conjures a vista of a campus crowned by cathedral towers portrayed within a pastoral picture peopled by kilted Scots. It is not unjust to the Celtic legacy so abundantly manifest in name, speech and mannerism that persist to our time, to put upon the record facts which support the claim that the Scots - more numerous than others as they are in Antigonish  were chronologically later than the first pioneers there. Ex-soldiers of disbanded British regiments unwanted after the loss of the American colonies in the Revolutionary War, and United Empire Loyalists, before the Gaelic was heard were clearing woods and breaking Antigonish soil. Two whose extraordinary careers in both General George Washington s and King George s armies, and a pair of Loyalist brothers, endowed their adopted country with a numerous and sturdy line of descendants. They were Nathan Pushee, Zephaniah Williams, Stephen and Gardiner Hulbert. There were more settlers from the former American colonies than these; our story is of only the four named, of whom two were great-great-great- and a third great-great-grandfathers of the writer's. Pushie in the American colonial period was variously spelled Pushey, Pouchee, Pushy, Pusha, Pouchaway, and most commonly Pushee. In Nova Scotia it became Pushie. The name relates to the Huguenots, the Calvanist Protestants of France, many of whom, after more than a century of Frenchmen killing one another in the name of God, in the late sixteenth century after the St. Bartholomew Day massacre in 1572, fled in large numbers to other countries. Some crossed the ocean to the Carolinas, Pennsylvania and New York. From France some went first to England, and some of these and their descent to America. The Plymouth pilgrims of 1620, who gave their name to the famous rock, had, in historians eyes, been influenced during their stay in Holland by Huguenot refugee neighbors. There was inter-marriage. Some Pilgrims referred to Huguenot forebears with Anglicized surnames, e.g., Paul Revere, son of Appolos Rivoire, a goldsmith who came to America via Guernsey. There was migration to the Massachusetts colony from Rochelle in France in 1662 and 1680, and by refugee families from the Island of Jersey in the 1670's. First generation Huguenots who settled in New England are estimated to number five thousand. A family document 1(a) notes that the first of the name of whom to the best of my knowledge there is a documentary record, was "Gabriel Pushee of French antecedents, settled first in lpswitch, Mass." and there married July 26, 1726 Sarah Williams (no kin to Zephaniah Williams). From whence came Gabriel Pushee 1st? The term "French antecedents" suggests he was not born in France. Some Huguenot families after settling in the American south moved to New England (e.g., the family of the Yankee patriot Paul Revere of Boston). That Gabriel was colonial-born is the more likely possibility. The lengthy military service of Pushee and Williams would have made them experienced soldiers. The fact that they re-enlisted in the American cause after their original enlistments expired, following upon battle experience, implies they were courageous. They fought in the northern and southern campaigns. When they bore arms to throw off what the rebellious Yankee colonists considered to be the British yoke, their's was a Spartan life, in which they would have known much physical hardship and danger. The American commissariat was inferior to the British. Arms, ammunition, and equipment compared to the well-fitted-out British were in short supply. The modern soldier is carried to the edge of the battlefield, or parachuted on it. In Pushee and Williams time enemies moved towards and away from one another by ship, horse, and shank's mare. The British moved their troops from New England to the South by ship, by virtue of the Royal Navy s mastery of the seas. Most Americans trudged the whole distance. The foot soldiers wore leather ankle brogues, shaped the same for either foot, which they switched each day to minimize wear. Their ammunition was black powder, carried in a cow's horn, and a box of lead bullets, which each man cast by pouring lead made molten over an open fire into a mould. A musket was slow to load from a powder horn, especially in battle. Before hand the soldier prepared cartridges, a complete round of powder and ball poured into a paper tube which the soldier made by winding paper around a wooden dowel hollowed at one end to receive a musket ball, the tube charged with black powder, and twisted to contain it. The cartridge was rammed down the musket bore, and ignited from sparks coming from a flint struck by a spring-powered trigger-hammer. If the cartridge got wet, the paper was discarded, the powder dried on a blanket, and reused. For the infantryman, his bayonet was indispensable as weapon and general-purpose tool. Until Washington s troops were taken in hand by a Prussian drill master, they knew little of parade ground polish, and less of manoeuvring in mass formation. These skills they acquired as the war went on. There was for the Americans, too, in emulation of European armies, an attempt at military smartness, e.g., Pushee and Williams if their hair was short would have it tied at the back of their neck; if long, it would be plaited down their back. In camp they were required to powder their hair daily. On the march the soldier cooked his own rations. Units of six men formed a "mess" which was issued with a cast iron cooking pot, heavy to carry. The route of an army could be traced by abandoned cooking pots. The daily ration was supposed to be one pound of beef, usually salt, and flour. The men broiled the beef, when they had it, on sticks over an open fire, and boiled vegetables in the pot. To sustain their horses and themselves, the men were driven by necessity to scrounging, and thus were not hesitant in taking from what was to be had from local food sources. The medical services were as primitive as the messing arrangements. Surgery was limited to extracting a ball with forceps, and amputation of an arm or leg without anesthetic; to ease the pain the patient bit a musket ball or leather gag, while the surgeon's mates held him down when the doctor plied saw and knife. Wounds were covered with dressings of flannel and oil, followed with a poultice of bread and milk. Septicemia was prevented in an amputation stump, or within a wound, by cauterizing with a red-hot iron. Blood-letting was the prescribed cure for all manner of ailments. There was a rough form of vaccination for smallpox, which required blood from a smallpox victim. Should a soldier be wounded, or take sick in that nonhygenic age of numerous contagious diseases, not to mention organic troubles such as appendicitis, mastoiditis, kidney disorder, et al, his chances of survival were slight. The strategy of the war and the tactics of battles are germane only to the extent to which the soldiers lives were regulated in our story of Nathan Pushee and Zephaniah Williams. The 17th of June, 1775, was a momentous date in American and British history. The colony of Massachusetts had mobilized the first of the 87,907 men of whom 67,907 served in the Continental Army, and 20,000 in the Militia. To deny Boston to the British, hills were fortified as part of the defenses of Charlestown. British ships bombarded the Yankee entrenchments and disembarked an attacking force. Again and again the British regulars, brave and disciplined, advanced, only to wither away from the accurate musketry and bayonet points of the Yankee rebels. As seen by military analysts, the Battle of Bunker Hill was a technical defeat for the rebels. Psychologically it was a rebel victory. Citizen amateur soldiers had fought off British professionals, had withstood bombardment from the Royal Navy's guns, had held their ground and manoeuvred in good order, had bloodied King George Ill s nose. The British learned that their enemy was not, as their officers had supposed, an undisciplined, cowardly rabble. Colonel Thomas Gardner's Regiment had its baptism of fire at Lexington, April 19, 1775, that incident which brought Massachusetts men flocking to the colours, among them Nathan Pushee, who before the month was out enlisted at Cambridge. He was a seventeen-year-old boy with less than two months service when, in the Company of Lexington veteran Captain Phineas Cook, he was in his first battle, Bunker Hill. Gardner s Regiment was in the thick of the carnage. The Colonel was killed. Captain Cook sustained a wound from which he would never recover, and caused his premature death in 1784. For the next eight years, Pushee would know the frustrations of do-as-you-are-told pattern of military life, its dangers in combat, and the privations of campaigning. Pushee s first enlistment expired after eight months. January 1776 he re-enlisted, a private in Captain Fuller's Company of the same regiment, now commanded by Col. Bond. Apparently he had volunteered for short-term service, for from March 1776 until January the records show him on strength of Captain Gibbs Company in Washington s Body Guards. 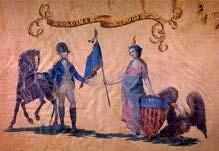 New Year s Day 1777 he was enrolled in Captain George Lewis Troop 3rd Regiment Continental Dragoons commanded by Lieut. Col. George Baylor. In December 1779 he re-enlisted again with Colonel William Washington as his commander. In the cavalry he was a trumpeter promoted to trumpet-major7. Youth was ever attracted by the myth of military glamour. For centuries, until displaced in recent times by the Air Force, the cavalry troopers were the glamour boys. British and Yankees had light cavalry, utilizing swift horses for mounted or dismounted action, known as dragoons. Normally they were not used for charging, although on occasion a tactical situation required them to charge. Their mobility and speed permitted them to observe enemy troop movements. The Yankees excelled in galloping from forest cover to fall on British baggage trains and forage parties. When part of a large body of troops, their duties were mainly reconnaissance until battle was joined, and then held in reserve for deployment to fight offensively or defensively as the situation demanded. In camp and on the march, they were posted in advance positions to prevent surprise attack. In battle they frequently fought as infantry. 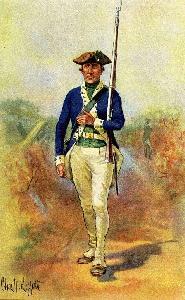 General Washington in 1779 ordered the dragoons to wear blue coats faced and lined with white. The headpiece was a leather helmet, ornamented with a fox tail, or bear fur, horsehair, or ribbons. A few sported French brass helmets, and from some source others had procured helmets of steel. They wore knee boots and spurs. Armed with a sabre, pistols, a short-barrel musket known as a carbine, and with his trumpet, on foot and horseback Pushee like his colleagues would cut a dashing figure. He had also the responsibility of looking after his saddlery, to keep himself and his horse clean, and feed both. Always in the cavalry the horses needs took priority over the men s. As a trumpeter he would ride immediately behind the formation commander, at whose order he would sound the calls which directed the men  "advance-trot-gallop, charge-retire, re-form, etc." The dragoons had miscellaneous duties, among these the supply of guards for the commander-in-chief and his headquarters. This was not a permanent assignment, but often Baylor's unit was known as "Mrs. Washington s Guards", which implies Pushee was one of the soldiers entrusted with protection of General George Washington. bodyguards during the Revolutionary War. George Washingtom Masonic National Memorial. The records relative to Baylor and William Washington witness that they were brave officers who led their men into battle, which were savage slashing and stabbing struggles with the British foe. His duties of trumpeter necessitating that he be close to the commander, it follows that Pushee thrust and parried with his sabre in the melee of cavalry action. In the northern campaign he was in the battles of Brandywine, Germantown, Monmouth and Paoli and Tappan. Between the Battles of Brandywine and Germantown was a skirmish at Paoli. A force of 1,500 Americans, Baylor's Dragoons among them, was in position to fall on the enemy s rear guard and baggage train. Tory spies disclosed their position to the British. September 20, 1777 the Americans were encamped at night when five British regiments quickly approached and surprised them. The Americans, roused from sleep and confused, were routed. The British took seventy-four prisoners and destroyed a thousand muskets left behind by the fleeing Americans. Pushee escaped. At Brandywine on September 11, 1777, the Americans lost. Their whole army retreated, some units completely disorganized. Here again, the British did not follow up their battlefield victory. The Yankees escaped, to fight again another day. The British reported 90 killed, 480 wounded, six missing. General Washington never let his Brandywine losses be known. The British guessed they had killed 300 Americans, wounded 600, captured 400. On 4 October 1777, the British were holding Germantown, near Philadelphia, when Washington's force, among them Marylanders, attacked. He had carefully prepared his plan, but the assault failed to dislodge the British defenders who inflicted greater losses upon the attacking Americans. The latter left dead 152, another 521 were wounded, and 400 captured, a costly affair with nothing beneficial to show for it. Hostilities ceased during the 78 winter, to resume at the Battle of Monmouth in New Jersey on 29 June 1778. Again, the Americans brought the British to battle. In casualties on either side, each some seventy killed, 180 wounded, were about even. Each side claimed victory. As the Americans had done at Trenton, the British slipped away noiselessly, leaving the field to Washington. The war moved south in December 1779 with the departure from New York of 8,500 British soldiers to invade. They captured Charleston. Pushee s Dragoons were now commanded by Lt. Colonel William Washington, a second cousin of General George Washington. Nepotism played no part in his career. He had been wounded at Long Island and again at Trenton, was promoted for his successes in the field which were accompanied by personal bravery. His opposite number in the British light cavalry was a bully boy of the British aristocracy, Lt. Colonel Banastre Tarleton, son of the Mayor of Liverpool, known as a cocky red-head, short in stature, an Oxford graduate. He headed the British Legion, sometimes known as Tarleton s Legion, recruited from Loyalists in New York, a composite unit with two hundred cavalry, one hundred infantry and a three-pounder gun. He performed capably in the northern campaign. Lt. Col. William Washington's reputation with his men was ace high. His troopers were well trained, described by one historian as "a cavalry outfit that sheer dash....(compared favourably) with anything led by Banastre Tarleton, about a hundred of them." William Washington is described as a six-footer with broad shoulders and long arms. He was a student minister when the war began, but dropped his studies at once, in favour of a soldier s adventurous life. His superiors complained he was impulsive, too easy-going with his subordinates, but it was acknowledged that in the field he was fearless, a good tactician possessed of the prime quality of a cavalryman  a leader who led his men, a fast fighter on horseback who sought and sabred his enemies.1 A man of William Washington's calibre would not have had in his small command cowards nor weaklings, hence my belief that Pushee was a stout soldier. The British were in Charleston. The Americans sought to harass them. There were skirmishes as the Americans neared the coastal city. On February 26, 1780 the 3rd Dragoons, with others, routed a force that included the British Legion. Tarleton's cavalry was driven back by Washington s Dragoons. For this reverse in fortune Tarleton had his revenge. An American force was stationed at Monck s Corner, thirty miles from Charleston. In the early morning of April 14, 1780 Tarleton led his British Legion into the American camp, charging into the surprised Americans with such fury they were completely vanquished. Tarleton s infantry bayonetted the Yankee militia unmercifully. The Americans suffered heavy loss, five officers and fifteen privates killed, many more wounded, and seven officers and sixty men captured. Lt. Col. Washington and his Yankee general, Huger, fled to safety. Eighty-two dragoon horses, one hundred and two draft horses, forty-two supply and baggage wagons, were taken.12 Nathan Pushee s luck had run out at last. He was alive, unwounded, but a prisoner of the British. A resume of Pushee's pension file in Washington, made in 1917, noted "he was captured in 1780 at Monck s Corner and made his escape; taken prisoner at Charleston, S.C., held about eleven months before he was released, and not exchanged until Peace." The statement "not exchanged until Peace" being incorrect  Pushee was never exchanged, i.e., turned over to the American Army in return for a captured soldier  the statement of escape after capture at Monck s Corner and re-capture at Charleston is, in the writer's opinion, incorrect. Years later in his sworn statement relative to his American Army service in support of his pension application, Pushee stated he was captured at Monck's Corner, but did not mention escape and re-capture. Zephaniah Williams career was a close parallel with Nathan Pushee's. He fought in numerous bloody battles, was spared to live to old age, and was taken prisoner of war. St. Mary s County, Maryland, which Williams in a legal document swore was his birthplace, is a point of land between the Potomac River and Chesapeake Bay; the Peninsula s nearest towns then appear on the map to have been "Port Tobacco" and "Benedict", both westward in Charles County, on St. Mary's landward side. Two small vessels, the "Ark" and the "Dove" brought the first settlers from England in 1634 to what became the State of Maryland. By 1703 the state s best land was occupied by tobacco planters who owned slaves. In the 1740's there were English, Scots, Irish, and Welsh settlers in Maryland.14 From whence came Zephaniah Williams ancestors? It is often said they were Welsh, a fair guess in that Williams is a Welsh name. The "List of Emigrants to America 1600-1700" has one hundred and two references to the name Williams, persons who sailed for America from London, Plymouth, lpswitch, Harwich, Dartmouth, etc., but Welsh ports are not shown. Some of the settlers were described as convicted rebels imprisoned after the Battle of Sedgemoor-Duke of Monmouth rising in 1685, which was savagely suppressed, followed by the Bloody Assizes conducted by the notoriously cruel Judge Jeifreys. Some were described as religious exiles, political exiles, serving men sold for a term of two years, apprentices, children stolen, maidens pressed, "and others who went from Great Britain to the American plantations." None of the Williams settlers was named Zephaniah. Some of them were carried to New England, some to Barbados, the most to Virginia.15 Quite possibly his forebears came after 1700. From such records as I have found, I have been unable to establish from where and when Zephaniah Williams family came to America. An inquiry upon the State of Maryland s Hall of Records Commission was answered with a courteously negative reply  a search of available records was fruitless; the St. Mary s County court and land records were destroyed in a fire, 1832. In the American Continental Army, commanded by General George Washington, there were seventy-five officers named Williams, of whom five were from Maryland.16 Zephaniah's name does not appear in the list of officers, nor has it been ever claimed that he was a commissioned officer. Assuming he possessed the normal characteristic of wanting to progress in the world, this suggests but does not prove that he was a person of limited academic education, and means, without strong political connections. When the United States government conducted its first census in 1790, there was recorded as living in St. Mary s County of Maryland four heads of families named Williams: Henry, James, George and Hugh. The latter two were apparently men of some financial substance; George owned three slaves and Henry one. Maybe Zephaniah was a member of one of these families, but this thought is speculation, which leads to more speculation  perchance the four named were brothers, or maybe cousins, and perchance not. What is a definite fact is that the sole documentary link between Zephaniah Williams and the State of Maryland is his own statement made when he applied for a land grant in Nova Scotia in 1808. When he settled in the British Province, what family ties he may have had to Maryland, or elsewhere in the States, were broken. I have not found any record, nor as much as a suggestion, that Zephaniah Williams and his immediate and later descent ever made contact with relatives in the United States. When the State's Congress made military plans, Maryland was an eager participant; 13,912 of her sons enlisted in the Continental Army, plus 9,000 state troops and militia. The Maryland men formed seven regiments of infantry. Their achievements began in the summer and fall of 1776, and continued until the British capitulation at Yorktown in the South. Possibly Zephaniah Williams was in the Maryland State Militia, and, or possibly, in the Continental Army prior to the first documentary record of his enlistment, but this is merely a possibility. What is a fact is that the National Archives at Washington and the Archives of Maryland certify that he is shown on muster rolls of Maryland troops in the classification of "Substitutions, Drafts, and Vagrants from St. Mary's County, June 10, 1778: Zephaniah Wiliams entered 2 May, time of serving  war. Monday, 18 May, 1778 ordered that the western shore Treasurer pay to Captain Nicholas Mauger one thousand six hundred and eighty dollars to enable him to pay sixty dollars Bounty to each of the following: Zephaniah Williams (among others)." An Oath of Allegiance was taken in February-March 1, 778. Inasmuch as he is not shown on the list of those who took the Oath, and did not enlist until 2 May, these are facts which suggest he may have been under the age of eighteen when the oath was taken. The returns of re-enlisted men in the period August 1778 to March 16, 1779 show him on strength of Lieutenant George Armstrong s Company in the Third Maryland Regiment commanded by Colonel (later Brigadier-General) Mordecia Gist. Maryland's muster roll of troops shows him as "Discharged 16 August 1780 killed". The date of the incorrect record of his death is that of the Battle of Camden in which his regiment took part, a butchery shambles which was America s worst defeat of the war. At this battle Williams was captured, not killed, by the British. At enlistment in May 1778 in Maryland, Williams and the others of his draft were far away from their regiment in New Jersey. Sometime in the next few months he became a private in the 3rd Maryland Regiment of the Line, to serve until his capture two years and three months later. Perhaps he was engaged in the New Jersey Battles of Monmouth on June 29, 1778, Stony Point 16 July 1779, and Paulus Point 19 August 1779. Some Maryland troops were involved, but in records I have had access to, the 3rd Maryland Regiment is not mentioned. These were minor engagements, their principle value being the psychological lift given the rebellious colonists from the small triumphs to their army. There was a Division of two brigades of Maryland soldiers in the winter's cold quarters of Morriston, fourteen hundred all told, the First Brigade in which were grouped the 1st, 3rd, 5th, 7th Maryland Regiments, and the Second Brigade of the 2nd, 4th, 6th Maryland and Delaware Regiment. With them on the trek south were the First Artillery of eighteen field pieces. General Washington was, as always, short of supplies. Having issued his orders for the move, on 13 April, he put his worries on paper, writing: "How they will get on for want of provisions, transportation, Sca (etc.) Heaven above can tell. I cannot." From Morriston the Division marched through Philadelphia to the Head of Elk in Maryland, where they took ship for Petersburg, Virginia. Their artillery followed by land. From Petersburg to North Carolina their commander, Baron de KaIb, a courageous soldier of fortune who would soon die, from eleven wounds, with so many of his men in battle, led them in a gruelling pace of 15 to 18 miles a day. All baggage was carried on the men s backs. They suffered from hunger, heat, and voracious insects which were no respecters of persons. De KaIb wrote to his wife, "My whole body is covered with these stings." After a week s rest at Hillsboro, N.C., the column pushed on. For every mile marched the difficulties for Williams and his comrades increas ed. They lived off the country, foraging as they went; last year s corn crop was nearly exhausted and the current crop was small and unripened green, their meat was the emaciated half-starved wild running cattle in the woods. Dysentery from poor food ravaged them. Their weakened horses left field guns along the way, reducing the division s artillery support to eight. Their misery was capped by Congress going over General Washington s head by replacing de KaIb with a new commander, Horace Gates, as unfortunate a choice as could be made. De KaIb remained with his men to fight. Early in 1780 the British had captured Charleston in South Carolina. In that area there were numerous skirmishes and several battles. The campaign in the South exemplified the horrors of civil war at their worst, a murderously fratricidal struggle between Loyalists and Patriots, with brother against brother, neighbor against neighbor. As the tides of war ebbed and flowed, some Patriot and Loyalist southerners changed sides,20 which occasioned brutal acts of reprisal. For the American side, the Battle of Camden in August 1780 was a desperately fought and lost encounter. General Gates Patriot army numbered 4,100, half again as many as the mixed British and Loyalist soldiery commanded by General Lord Cornwallis, but of the Americans only the 900 Maryland men in two brigades,, and the Delaware Regiment, were experienced soldiers. The remainder were militiamen, untrained and undisciplined. General Gates, in American military lore not a respected figure by his record as assayed by historians, seems to have combined stupidity and bullheadedness, with a touch of cowardice emerging when failure came from his leadership. Cornwallis, knowing the rebels were somewhere near, left Charleston in search of them. His troops were fresh and well-fed. The Americans had been marching for days, their objective to free Charleston. On 15th August, the Coinmissariat issued meat and corn. In lieu of the usual rum ration Gates ordered each man be given a gill of molasses. Instead of a stimulant, the molasses when mixed with the troops meal of half-cooked meat and cornmeal mush acted as a physic. The already worn down men, half sick and bone weary, started another march at night. Because of the physic, the men broke ranks often to relieve their diarrhea. For four hours they trudged through swamp and sand. Without warning to either side, the opposing armies in the dark blundered into one another, to the mutual astonishment of the respective commanders. Gates rejected his staff's advice to withdraw. Each army formed for battle before daybreak. Three Maryland Regiments and the Delaware Regiment of the 2nd Brigade were on the American s right; the 1st Maryland Brigade (William's Unit) was held in reserve. Only the day before had the Virginia Militia, now front-line troops in the Americans centre, been given bayonets, without instruction in their use. The battle began with the thunder of the Royal Artillery s four guns, answered at once by the American six. The British took the initiative with a charge against the American centre by the Welch Fusiliers and the West Riding Regiment. Steadily, coolly, the British regulars advanced, a scarlet-clad wall which fired by volleys and closed with the bayonet. It was too much for the Virginia and the North Carolina Militia to take. One company of the Carolinians fought bravely. The rest with the Virginians panicked and fled, some throwing away their arms. The British regulars spitted them in a bloody shambles that was worsened by a charge into the fleeing militiamen by Tarleton s cavalrymen. The militiamen, who until a month or so before had been peaceably farming their soil, were, by the horsemen, cut down like chaff. The British at Charleston held captive a growing bag of prisoners of war. Further to their manpower requirements to meet the challenge of the rebelling American Colonies, they were at war with Spain and France, which necessitated garrisoning British possessions in the Caribbean. It has been unequivocally documented (e.g., "The Battle of Cowpens", Kenneth Roberts, Doubleday and Co, of New York) that the war in the South was murderous, a civil war between Loyalists and Patriots, some of whom, as the fortunes of war shifted, changed sides. Pushee and Williams, young and healthy men, chafing in the confined stockade with its unhygenic environment and indifferent rations, faced a bleak prospect as prisoners. However it happened, whatever the inducement, Pushee and Williams, veterans of the American Continental Army who had fought in numerous battles against the British, were enrolled in the Duke of Cumberland s Regiment, named after a brother of King George Ill, the most hated man in the Colonies. This duke is not to be confused with Stinking Willie, the earlier and opprobrious Duke of Cumberland of Culloden ill-fame. The Regiment was commanded by another blue blood, Lord Charles Greville Montague, a son of the Duke of Manchester, hence the name by which the Regiment was often known  Montagues. The fact that Williams and Pushee were in a unit consisting entirely of former officers and men of the American Continental Army suggests strongly that there was an en masse movement into the British Army, in response to the British pledge that the Americans would not be called upon to fight their own people. It is significant that officers forsook their former allegiance to bear arms for their erstwhile enemies. Whatever the means and the inducement employed by the British, the former Yankee rebels became British soldiers on garrison duty in Jamaica, to where they were taken in the summer of 1781. There they spent three years in parade-ground soldiering; no enemy attacked when they were in Jamaica s semi-tropical heat. The Island s sugar plantations operated by slavery. In that period, unrest in slave enclaves was frequently put down by military might. We can only guess that Pushee and Williams suffered monotony in the daily routine of spit and polish, guard mounting, endless fatigues, marching and counter marching to the shrill keening of the fifes and Rat-a-Tat-Tat drums, with always the lash poised for applications to the backs of delinquents. How Williams adjusted to this life we do not know. Pushee was promoted Sergeant  possibly, but not necessarily, this was a carry-over from his American rank of trumpet-major  which indicates he was a willing soldier. In the years when the British Empire was being built, colony by colony, territory by territory, many, many more British soldiers died of disease in the outposts than succumbed to enemy attack. Yellow fever, malaria, typhoid, smallpox, typhus, Asiatic cholera, took a terrible toll of life in the armed forces abroad. As they had been from enemy weapons, again Williams and Pushee were spared. In mainland America the war ground on to its close with capitulation by the British. The victorious colonists understandably were not in mood to welcome back those of their number who had soldiered for King George, no matter what the terms that led them into his service. What was to become of the former Yankees, forlorn in Jamaica? It was a British custom to encourage disbanded soldiers to settle upon land in areas considered to have development potential. In Lord Montague s correspondence with Nova Scotia Lieutenant Governor Sir John Parr, 14 March 1783, he stressed his officers and men could not be taken back to Carolina where they had been recruited, and asked that the authorities remember them when planning allocation of lands in Nova Scotia.26 The Crown s Surveyor, Major F.W.W. DesBarres, had spoken favourably of the Chedabucto Bay-Strait of Canso area, and thus lands for Cumberland s Regiment were chosen. The Regiment was disbanded 24 August 1783.27 Lord Montague arranged transport for all desirous of taking land in Nova Scotia. About three hundred of the Regiment s personnel, with their commander, sailed on two transports, the Argo and Industry. December 13, 1783 the Argo arrived at Halifax and a few days later the Industry, which had had to put into Havana. To natives, as many were, of the Southern Colonies, Nova Scotia s climate must have been a severe shock. After their long stay in Jamaica s warmth, the soldiers became refugees, awaiting land grants, spending a miserable winter in huts erected on what is now Hollis and Granville streets in Halifax. Lord Montague shared his men s hardships, dwelling with one small group in huts five miles from the city.27 Poor Montague. From his record a good man who did everything in his power to assist the men in his command, lived but six weeks in Nova Scotia s hard winter. A putrid sore throat (was this diptheria?) carried him off. Probably numerous men of his former command died with him in Halifax (this allegation is not an established fact) for when spring came, only half of the three hundred who had come from Jamaica were of a mind to settle in Nova Scotia. They were six captains, two lieutenants, one ensign, an adjutant, a surgeon, six sergeants, thirteen other non-commissioned officers, twelve bandsmen drummers and fifers, one hundred and twelve other ranks, one hundred and forty-nine all told, and with them Sergeant Pushee and Pte. Williams, still possessed with their strong physique. Again Pushee and Williams, with their colleagues, were loaded on a transport, the Content. They disembarked at Chedabucto on May 16, 1 784, a date that historian A.C. Jost postulates as Guysborough s Natal Day. The detail of land grants and the usual disputes which arose need not concern us here. It was customary to grant one thousand acres to a field officer, 500 to a subaltren, 200 to a non-commissioned officer and 100 to a private. Sergeant Pushee was given 200 acres, being Division SE, Block K, Number 10. Private Williams 100 acres were at Division SE, Block H, Number 1. The town intended to be founded by the Cumberland Regiment grantees was named Manchester (after the late Lord Montague s ducal father), overlooking Chedabucto Bay. The hopes for a successful settlement at Manchester were not realized. One assumes the soil, the climate, the isolation, the labour of pioneering were too much for Southerners to cope. Very nearly all of the Cumberland veterans, for whom Lord Montague had held much sympathy and expectation, drifted away. It was not the only Guysborough settlement. Ironically, ex-soldiers of Tarleton s British Legion were also taken to Nova Scotia, first to Port Mouton in Queen s County. Some of them founded St. Stephen in New Brunswick, and a few went to Chedabucto Bay, but these latter, like their former foes Pushee and Williams who had taken prisoner, did not stay. The Land Grant Records in Nova Scotia s Public Archives have a "Draft of Grant to the officers and men of the late Regiment stiled (sic) the Duke of Cumberland s....also to.... forty-eight Loyal Refugees....at Manchester." This document lists Pushee and Williams in the roll of soldiers. The "tract of land containing thirty thousand and seven hundred acres (is) situate lying and being in the Township of Manchester... .at the head of Chebucto Bay, north, then east to seashore of Gut of Canso. ...reserving all white pine if any should be found growing thereon." (The pine was to be reserved for use as masts and spars in the Royal Navy s ships, a reservation that some Nova Scotia settlers regarded with reservations of their own.) Reserved also were "all mines of gold, silver, copper, lead, and coals." The obligations placed upon a grantee were heavy. They were bound to pay yearly rent of two shillings for every one hundred acres; within three years "the grantee must clear three acres in every fifty acres of clearable land....or clear and drain three acres of swamps or sunken ground, or drain three acres of marsh." Where the land was accounted barren, the grantee must place upon it "three meat cattle, and continue the same thereon, until three acres of every fifty be fully cleared and improved." The grantees were further obliged to erect "a good dwelling house, to be at least twenty feet in length and sixteen feet in breadth." On stony ground not fit for pasture or planting, within three years the grantee was expected to dig a stone quarry. Failure to pay the rent or meet the other stipulations would void the grant, the land reverting to the Crown. And finally, perchance a bitter pill for the former American rebels to swallow, every grantee had to take an oath of allegiance, which would forever dispel any hopes they may have had to return to their homeland.../ l do promise and declare that I will maintain and defend to the utmost of my power the authority of the King in his Parliament as the Supreme Legislature of this Province." The Draft of Grant was signed by John Parr, Captain General Governor and Commander-in-Chief over our Province this (blank) day of 1785. Meantime, four days before the Cumberland ex-soldiers arrived in Chebucto Bay, on 12 May 1784, Colonel Timothy Hierhily and his late subordinates in the Royal Nova Scotia Volunteers approached Antigonish Harbour and anchored off what was named "Town Point". The settlers were ex-soldiers of Colonel Timothy Hierlihy's Regiment, who had spent the war safely, if monotonously, in garrisons at Quebec, Prince Edward Island and Halifax. They formed a sister colony to Manchester. Apparently Williams and Pushee considered their Manchester grants to be place of poor prospects. They moved to what became Antigonish County, where both bought land. Being personae non gratae in the country of their birth, the ambitious of the ex-soldiers perforce had to make homes for themselves in Nova Scotia. There is a common belief that men who for a long period live in the paid-clothed-fed military milieu lose their initiative, and in later civilian life shun work, to live an idle life of drunkenness. That reputation which clings to some old soldiers does not apply to Williams and Pushee, and more of their colleagues, from Montague s band. Neither Pushee nor Williams awaited unseen brides from the old country. Williams found a wife in Truro, Ann (one family records notes her name as Jane), daughter of George Scott, in about 1 788? Ann Scott bore husband Zephaniah Williams ten children. The family records32 list them as Alexander 1 790 wed Mary Ireland, Anne 1792 wed Alexander G. Gordon, John 1 794 wed Sarah Pushie (Nathan s daughter), Leah 1796 wed William Pushie (Nathan s son), Rachael 1797 wed Thomas Pushie (Nathan's son); there is no record of the year in which the sons Zephaniah Jr., Henry, and George were born, nor whom they married. The youngest, Dorcas, married James Taylor of Pomquet. Historian J.W. MacDonald, M.D., in his "History of Antigonish County (1876)" attributes to Zephaniah s wife sterling qualities of character...."About the year 1794, Mrs. Williams, fearing that the day was very far distant when the county would boast of a school, became anxious for the education of her boy, then six years of age. After serious deliberation, she determined to set out with him to Truro where he could be placed under the care of an uncle. So the journey was undertaken on foot, through the woods along the Gulf Shore to Pictou, and from Pictou to Truro, with nothing to guide them but a pocket compass and a blaze upon the trees. Such was the value of education in the eyes of this brave woman. Colonel Timothy Hierlihy held 2,200 acres, some of which he sold. The projection of land, some five hundred acres, bordered by the South River and the upper reach of Antigonish Harbour, Hierlihy sold in part to Williams, hence the name "Williams Point".33 Likely Williams moved to his land when he bought, but a later signed record indicates he moved to Antigonish in 1803, although this writer is reasonably sure that by 1803 Williams had been living in Antigonish County (as it later became) for at least a decade. In 1793, the time of the purchase from Hierlihy, Williams was described as a shipwright. In 1797 when he bought another one hundred acres, he was described as a husbandman (farmer). A census of 1817 lists Zephaniah Williams living at Addington Forks (the West River district) with a wife, two males and two females. He is described as an American and his wife as Scottish. An 1827 census lists Zephaniah Williams, but only one adult of that name, which suggests that Zephaniah Jr. is meant. There is a tradition35 that Zephaniah Williams was "indirectly responsible for the laying out of the principle street of the present Town of Antigonish. On one occasion he wished to go to the Hartshorn Grant (Addington Forks) and engaged an Indian, one Joe Snake, to pilot him. Williams had his axe in hand and blazed trees along the trail as they struck into the wilderness that faced them when they left the head-waters of the Harbour. Others on a similar mission later followed on the blazes, until a well-defined trail was formed. On this day Joe Snake s instinct for direction was not functioning as well as usual, or possibly the sun was obscured by clouds. At any rate, the course he set over a perfectly level piece of ground is shown today in the sweeping curves of Main Street." There was fertile intervale land, with a healthy timber stand, in the West River area, to which settlers were attracted. Williams, after pioneering at Manchester and Williams Point, moved for a third time. The Public Archives of Nova Scotia have a petition for a land grant from Williams. Addressed to His Excellency Sir George Provost Bart., Lieutenant Governor and Commander-in-Chief over His Majesty s Province of Nova Scotia, the document reads "...The petition of Zephaniah Williams Humbly Sheweth That your petitioner was born in St. Mary's County State of Maryland, that he served as a private soldier three years in the Duke of Cumberland Regiment in the Island of Jamaica. That he is a subject of the United Kingdom of Great Briton and Ireland. That he has resided at Antigonish in the County of Sidney this five years past. That his family consists of a wife and ten children who are all now resident of the Province. That he has never drawn any Settleing land from the King  your petitioner therefore Humbly prays your Excellency would be pleased to allow him to draw for him Self and Family Such proportion of unlocated Land eastward of the uper most land Settled above Blanchard Grant on what is called the West River of Antigonish as to your Exelcency may Seem meet and your petitioner as in duty bound will ever pray, Antigonish June 22nd 1808 Zephaniah Williams." Although Williams petition observed that he had not "drawn any Settleing Land from the King", he was certainly a grantee at Manchester, as a result of his service in the British Army. His petition for land on the West River diplomatically did not mention that he had also been a soldier in the American Continental Army. Justice of the Peace Nathaniel Symonds took Williams oath relative to the petition, and added a recommendation of his own that "the two eldest sons, who are able young men and nearly 21 years of age should draw one hundred acres each." Williams petition was presumably regarded favourably, as attested by an Archives document signed by the Government treasurer "... Recommended for consideration an allotment proportionate to his family comfortable to the King instruction. Agreed to in Council 11th July 1808 (signed) Michael Wallace." Soon thereafter the Williams family settled in the West River district where great-grandson Murray Williams lives to this day. The majority of the descent, because of inter-marriages with the Pushies in the first and second generations, are descendants also of Nathan Pushie, and some of the Loyalist brothers Stephen and Gardiner Hulbert. Tradition, legends, handed-down anecdotes, get mixed in telling and re-telling. What may or may not be the same story quotes the Antigonish Church of England pastor Rev. Thomas Howland White, in November 1829, asking his sister Agnes in Shelburne to inquire from their father, Captain Gideon White, if he recalled a non-commissioned officer in his command named Pushee...."he is living at this place and says he was recruited out of the prison at Charles-town." Captain White in 1780 was in command of the Charlestown district. Pushee is possibly the central figure in the story, as it is to be noted that the Montague Regiment records show him as a sergeant, a rank necessary to be given a two hundred acre grant; Williams land grant at Manchester was for a private soldier s rank, one hundred acres. As did Williams, Nathan Pushee found his grant at Manchester, and a second allotment of a town lot at Guysborough, a poor place to make a living, and he, too, moved to more fertile soil, to settle upon ground which was much of the later Town of Antigonish; his clearing bordered the South side of the West River. Where the river was bridged at St. Andrew's Street, the first structure was known as Pushee s Bridge. An accolade was conferred upon Pushee by historian D. Graham Whidden, in his book "History of the Town of Antigonish", who wrote of him "...he may be considered the founder of the town, for he resided there the remainder of his life, and his descendants have continuously lived in the town." On April 20, 1787, he took to wife a widow, who is understood to have been a native of Northern Ireland. From the handed-down stories of Jane Porter Pushee, nee Brown "Aunty Jane", one may conclude that his choice of bridebrought him good fortune, for he married a remarkable woman of character and physical strength. Their lives as pioneers would not have differed in the hardships and scarcities that affected all of their generation in the new land, which have been many times described by historians generally, and need not be repeated here. From the marshy ground and forest they made a farm, living first in a log house, and then a frame dwelling, which was in use one and one-half centuries later. There is a tradition that the Pushee farm had the first dug and stoned well in the County. With the passing years, Nathan and Jane Pushee moved from maturity to old age. The Pension Records have Pushee s sworn affidavit in support of his pension application. It reads: "Nathan Pushee of Antigonishe in the County of Sydney and Province of Nova Scotia, Farmer, maketh oath and saith that he was born in Massachusetts in the County of Worchester in the United States of America in the month of October in the year of Our Lord One Thousand Seven Hundred and fifty-eight  that in the month of May in the year of Our Lord One Thousand seven hundred and seventy-five the deponent enlisted in the American Army at Cambridge in a Regiment then commanded by a Colonel Gardner and fought under him in the engagement at Bunkers Hill which took place on the seventeenth day of June in the year aforesaid in which engagement Gardner was killed and deponent further saith that he remained in the American service until the expiration of the time he had enlisted for when he again enlisted in the aforesaid service in the year of Our Lord One Thousand seven hundred and seventy-seven in a Regiment of Cavalry called Lady Washington s commanded by Colonel George Baylor  that deponent was attached to said Regiment until the year of Our Lord One Thousand seven hundred and eighty or thereabouts, when he was taken prisoner by some British soldiers at a place called Monck s Corner in South Carolina  and deponent further saith that he was detained a prisoner at Charleston in South Carolina about eleven months by the British and then released  and deponent further saith that he hath resided in Antigonishe aforesaid since the year of Our Lord One Thousand seven hundred and eighty-four. (signed) Nathan Pushee." From the affidavit, one concludes that Pushee considered it diplomatic not to mention his post-Continental Army career with King George s Duke of Cumberland Regiment. His claim was allowed. The American Government awarded him a lifetime pension of $132.00 a year, effective 4 March 1831, with a special allowance of $66.00. The total received was $1,056.00, a substantial sum of money in 1838. He did not long enjoy it. He had heard of an ex-comrade, Captain Jesse Smith, with whom he had served in Col. Win. Washington s cavalry detachment that had supplied guards for General George Washington. Enroute home he stopped off in Salem to see his friend. The old soldiers had not seen one another for fifty-nine years; old memories from their campaigning were revived in several days of reminiscing. The visit coincided with a rally in Salem of the 1812 War veterans, and Captain Smith and Trumpet-Major Nathan Pushee of "Washington s Guards" were made much of. From Salem, Pushee went to Newport in Nova Scotia, to visit a friend. He arrived seemingly in good health, but the long trip, the exhilaration in Washington, the excitement in Salem, were too much for the octogenarian s health to withstand. He died suddenly in his friend's home, presumably from a heart attack. The remains were taken to Antigonish. Jane Pushee lived an unusually long life. Her obituary in The Casket, May 19, 1853, gave her age at death as 105. American Government Pension Records show her having been born in 1760, which, if correct, means she died at 93. By her first marriage to John (?) Porter it is thought she had a son; if so, there are no known records of him. The Casket paid tribute to her: "(She) was the first white woman who came to this part of the country, having settled here in 1784. She was shortly afterwards married to her late husband...She was through life, proverbial for her generosity and kindness; and where sickness amongst the first settlers of the then new country was found, she was rarefy absent, and contributed even her means to aid the poor and suffering. When the country was without roads, and the great depth of snow in the winter season seemed to offer unsurmountable difficulties to travelling, she would be found travelling on snowshoes to minister to the sufferings of the sick. She has, on some of these occasions, been known to take the clothes off her own back and put them upon those of poorer persons whose sick condition required more than they had means to provide. She attended at the birth of more than a thousand persons in this county, by whom, with her other friends, her memory will long be deeply and gratefully cherished. Her descendants number 147, being 10 children, 70 grandchildren, and 67 great-grandchildren." The children of Nathan Pushee and wife were Johanna, married the Irish immigrant Moses Somers, progenitors of the Antigonish family of Somers; William, married Leah (daughter of Zephaniah Williams); Thomas, married Rachael (daughter of Zephaniah Williams); George, married Catherine (daughter of John and Mary Livingstone Chishoim); John, married to Theresa Clark; David, married Jennie (daughter of Joseph Baxter); Sarah, married John Williams (son of Zephaniah).41 Although The Casket s obituary of 1853 reported there were ten children, only the above seven names are known. It is reasonably possible that she bore children who died in infancy or youth, a common occurrence until relatively recent years. It is a sad coincidence that when Mrs. Pushee in 1852 applied for an advanced-age pension, fourteen years in her widowhood, it too was granted at the rate of $132.00 annually. It was retroactive five years, awarded in May 1852. A year later she died. The Hulbert family of American origin, which appears early in the annals of Antigonish, were in the United States known as "Hurlbut"; when transplanted to Antigonish, the name became "Hulberf . The history and genealogy of the Hurlbut-Hulbert family was well documented in a book The Hurlbut Genealogy, or Record of the Descendants of Thomas Hurlbut" by Henry H. Hurlbut, Joel Munsell's Sons, Publishers, Albany, N.Y., 1888. Before the Hurlbut-Hulberts came to Antigonish, four generations of them covering one hundred and ten years lived in the New Engiand Colony of Connecticut. The sire in America was Thomas Hurlbut, who supposedly crossed the Atlantic in 1635 on the ship Bachilor out of London. She was a small 25 tons, conveying to the new land an English soldier-engineer, Captain Lion Gardiner, his wife, a female servant, and fourteen passengers including Hurl but. Gardiner was engaged by a colonizing group of noblemen, holders of the Connecticut Patent from King Charles I, which granted a large land tract on the banks of the Connecticut River. Gardiner erected a fort at the river mouth, named Saybrook, on the Atlantic coast. Thomas was a soldier at the fort. Writer Henry H. Hurlbut suggests Thomas birth was in about 1610, but whether England or Scotland is unknown, although Henry favours the latter country. At the time of Thomas arrival, the settlers coming into New England were Puritans from England. References to later generations of Hurlbuts in America witness they were Puritans, implying English ancestry, but this is not necessarily so. Thomas nearly lost his life in an encounter with the Indians in February 1837, an incident in the Indian Pequot War. He was a sentinel on watch while colleagues were felling trees, when the terrorizing war whoop of a war party signalled attack. With muskets and swords the whites held off the marauders while retreating to the fort s shelter. Several defenders were killed, and Hurlbut, shot through the thigh with an arrow, weak and limping, barely reached safety. He recovered, and carried on his trade of blacksmith, which he must have learned in the old country. He established at Wethersfield inland (now a suburb of Hartford). He was a sharp businessman. The Colonial records note "2 March 1642 Thomas Hallibut (sic) was fined 40 shillings for encouraging others in taking excessive rates for work and ware." The fine was "respited" after a year when another tradesman was involved in a "tryal" to make "nayles" with less loss and cheaper rates. Thomas, the progenitor of the Huribut-Hulberts, was a man of good standing; he was Clerk to the "Train Band" in 1640, Deputy to the General Court, Grand Juror, and Constable in 1644. He was granted several pieces of land around Wethersfield, the largest 120 acres, in 1671, for service in the Indian wars. He died soon afterwards. Nothing is known of his wife, saving her Christian name, Mary. They had six sons, and mayhap daughters. John Huribut, Thomas second son, was born at Wethersfield, 8 March 1642. He followed his father in the trade of blacksmith. At 27, settlers making the town of Middietown Ct., propositioned him to set up shop in their community "to do Town s work of smithing for seven years." John made a pact and kept it, prospering in the process. He wed Mary Deming, his sweetheart from Wethersfield, and fathered ten children. An industrious man, he accumulated wealth, and local prestige. He was made a freeman in 1671, and held the office and rank of sergeant in the citizen soldiers. Death took him at age 48. His estate in cash was f 373, 15s, 6d; the house, shop and home lot were valued at 1100; other lots 1160, smith s tools and iron 110. In pioneer Connecticut in the late 1600's, John's estate was that of a very successful man. The ninth child of John and wife was David, born at Middleton, 1688. He also was a blacksmith, after apprenticeship establishing at Upper Houses (now Cromwell, Ct.), where in 1712 he was granted four acres. With a partner, he rented a grist mill for eight years. He married Mary Savage. He, too, prospered and acquired land lots, portions of which he deeded to some of his eleven children when they married. He and his wife were founders of the Second Church at Middletown. In 1744 they moved to Groton, Ct., and after a few years returned to a previous home at Chatham (Middle Had-dam, Ct.). His wife Mary died. He married Mercy ---, and in October 1773 he died at 75, an affluent man of property. Next in the chain came David and Mary s son, Stephen, their eighth child, born at Middletown probably in 1725, and married to Susannah ---. They were admitted to full communion in the Middle Haddam Church in June 1745, which implies they were considered sound in the cheerless tenets of Puritanism. That fall father David deeded to Stephen a "piece of land in Middle Haddam with a barn and shop thereon". What the shop was  smithy or otherwise  was not recorded. Stephen, like his father and grandfather, was enterprising. In 1756 he bought 35 acres with a house and other buildings, and before and after 1762 bought other parcels of land. He speculated in new buildings. He must have been an adventurous man, for during five years he was engaged in whaling voyages, a venture that demanded brawn and bravery, not to mention luck. He was the oldest Hurlbut to come to Nova Scotia, and if, as will be explained in later paragraphs, the record we have is correct, he paid dearly for his political beliefs. Because of his adherence to the British cause when the thirteen colonies rebelled, he "lost much of his property by depreciation and forced sales." According to one account, he died at Wintonbury (now Bloomfield), four miles from Hartford, aged over one hundred years; another account quoted by writer Henry states he died at 95 in Great Barrington, Mass. The records respecting the first Hulberts in Antigonish are confusing. Certainly the brothers Stephen and Card iner settled permanently, married, begat children, and died in Nova Scotia, where they are buried. This Stephen had a son, Jonah, baptized in 1753, "...in the Revolution a Royalist and with his father went to Nova Scotia where he lived until the war was over when he returned to Connecticut" and died at Great Barrington, Mass. This Jonah had two sons, Stephen and Gardiner, who were the Antigonish permanent settlers. Stephen, born at Middle Haddam, 4 April 1777, and Gardiner born in Nova Scotia, 1 March 1783, were children during the period the first Hulberts lived in Antigonish. Henry, the genealogist, states the brothers returned to New England, and afterwards went back to Nova Scotia, in 1810, where they lived to death. Our other source of information, "History of the Town of Antigonish" by D.G. Whidden, 1934, relates that Jonah Hulbert came with his family from Connecticut to Antigonish in 1788, bought a lot of land from John McColla (which would be within the modern town boundaries), and was married to Susan Ann Crosby. (Note the similarity to the wife of the first Stephen, whose name was said to be Susannah. Whidden wrote Jonah was born in England, which was erroneous, and that "he did not stay long in Antigonish but returned to the United States, leaving behind his two sons Stephen and Gardiner who were cabinet makers." Both of these contradictory accounts from Henry Hurlbut and D.G. Whidden cannot be correct, and quite possibly may be in some degree incorrect. It is the writer s guess that the Stephen born in 1725 and his son Jonah, baptized 1753, came to Nova Scotia; that Stephen returned soon to Connecticut; that Jonah remained for many years, during which his sons Stephen, born 1777, and Gardiner, born 1783, matured; that Jonah in later life returned to the United States, and his sons remained in Antigonish. It is difficult to accept that if the brothers Stephen and Gardiner were taken back to the United States in their childhood; in 1810 when they were aged 33 and 27 respectively, they left the States in favour of a pioneer farming community in Nova Scotia. The weakness in this theory is that if they indeed were cabinet makers, it is doubtful they could have acquired that trade in Antigonish in the early 1800's. The reader s opinion on these comings and goings will be as valid as the writer's. Although Zephaniah Williams, Nathan Pushee, and their wives, worshipped in St. James Church from its inception, their names are not recorded in the "St. James Cemetery Interment List 1804-1864". Where they were buried is not known. The cemetery list records numerous of their children and grandchildren s names, but no Hulberts. It is inconceivable that the pioneer Hulberts did not worship in this church. As of the time of this writing in 1981, the descendants of Nathan Pushee, Zephaniah Williams, Stephen and Gardiner Hulbert are to be found across Canada and the United States. To the latter country from the 1880 s to the 1930 s every generation contributed a generous quota, forced from Nova Scotia by economics. They filled the professions and trades at home and in far places  clergy, medicine, law, pedagogy, engineering, banking, metal working, plumbing, broadcasting, journalism, nursing, mining, carpentry, careersoldiering, railroading, lumbering, and, as the families had begun, farming. In World Wars One and Two and in Korea, they enlisted in the Canadian and American forces. Many of these, like their soldier-pioneer progenitors, were spared death in battle; some of them fell, to lie in foreign soil. 1"The Days of the Upright", A History of the Huguenots, O.l.A. Roche, Clarkson N. Potter, inc., New York 1965. 1(a) Letter from Ezra S. Stearns, Fitchberg, Mass., 13 Nov. 1914, to D. Howard Williams, Lower West River, Antigonish Co.; Stearns was seeking information on Nathan Pushee s descendants. Hereinafter referred to as "Stearns". It is coincidental that the surname Stearns is found in Antigonish County also. 2"History of Worcester County", Vol. 1, D.H. Hamilton Hurd 1889. Hereinafter referred to as "Hurd". 4"Massachusetts Soldiers and Sailors of the Revolutionary War". Compiled from the Archives, published by the Secretary of the Commonwealth, Boston, 1904. 5"Now We Are Enemies, The Story of Bunker Hill", Thomas J. Flemming, St. Martin s Press, New York, 1960, and "Historical Register of Officers of the Continental Army During the War of the Revolution April 1775 to December 1783", Francis B. Heitman with Robert H. Kelby, Baltimore 1973. Hereinafter referred to as "Heitman". 7Revolutionary War Records Section, File W13835, Department of the Interior, Bureau of Pensions, Washington, D.C., hereinafter referred to as "Pension-Records"; and History  Worcester. 8F.P. Todd, Henry Regnery Co., Chicago. 9"The War of the Revolution", Christopher Ward, John Richard Alden editor, MacMillan Company 1952. Hereinafter referred to as "Ward". 10"The War in the South", Donald Barr Chidsay, Crown Publishers, New York, 1969. Hereinafter referred to as "Chidsay". 14"Maryland, A Bicentennial History", Carl Bode, W.W. Norton Inc., American Association for State and Local History, Nashville. Hereinafter referred to as "Bode". 15"Original List of Persons of Quality", john Camden Hotten, Baltimore Genealogical and Publishing Co., inc., 1978. 18"Road to Yorktown", John Selby, St. Martin s Press, New York 1976. 19"Battles of the American Revolution 1775-1781", Henry B. Carrington, Promontory Press, New York 1871, reprinted. Hereinafter referred to as "Carrington". 20"The Battle of Cowpens", Kenneth Roberts, Doubleday and Co., New York, 1978. 22"Timothy Hierlihy and His Times", paper by Charles J. MacGillivray, Editor of The Casket, Antigonish, N.S., read to the Nova Scotia Historical Society, Nov. 12, 1935. Hereinafter referred to as "MacGillivray". 23"King George s Army 1775-1783", Philip Katcher. Hereinafter referred to as "Katcher". 25Letter to the writer 10 October 1980 from the Department of Archives, National Army Museum, London. 1950, hereinafter referred to as "Jost". 29Colonial Correspondence Nova Scotia, reproduced by MacGillivray. 3lAlthough it was written, by a person whose identity is unknown to me, that Ann Scott Williams was a daughter of George Scott, a grantee of Truro Township, the book "Historical and Genealogical Record of the First Settlers of Colchester County", by Thomas Millar of Truro, 1783, does not warrant this statement. The Millar book, page 131, records that George Scott and wife had three daughters, Esther married to James Rutherford; Ann married to William Flemming and bore him a large family; and Elizabeth married to Thomas Dickey. 32Reproduced in "History of the Town of Antigonish ~, D.G. Whidden, The Casket Printing and Publishing Company Ltd., Antigonish, N.S. 1934. Hereinafter referred to as "Whidden". 34M5 by Charles W. Hurst, 1977. 36"History of Antigonish", Rev. Ronald MacGillivray, published in The Casket, Antigonish, N.S. 1890-92, with later documentation by Charles J. MacGillivray, edited by Raymond A. MacLean, Ph.D., published 1976, The Casket Printing and Publishing Company Ltd.
38"History of Antigonish County, J.W. MacDonald, M.D., 1876, republished by Formac Ltd., 1975, Raymond A. MacLean, Ph.D., editor. 39"The Story of St. James United Church, Antigonish", 1804-1979.